Thanks to the Congressional election of 2018, the fact is that anti-Semitism can still infect governing bodies of nations as the United States has elected three or more anti-Semites whose hatred of Jews is so obvious; their own party leaders have denounced some of their statements and Tweets demanding for them to apologize. Their apologies were less than satisfying and their return to detestable statements has cemented the fact that anti-Semitism now sits in the United States Congress and as such could eventually sit in the White House leading that nation. Now BTC editorialists know that no nation should elect such a leader, that should be impossible and you should know that. But is it really impossible for such? Let’s take a look over at Europe. Currently, if what many are predicting turns out to be true, the current ruling party will not be the one which chooses the next coalition and their main adversary may even have sufficient to rule absolutely without the need for smaller parties supporting them. We are speaking of the British Labor Party. Should the British Labor Party win in the House of Commons, they will select the next Prime Minister to sit at 10 Downing Street. Parties normally select the leader of their party to fill that address and the current Labor Party leader is Jeremy Corbyn, a man who calls Hamas and Hezballah leaders and members his friends. He, and his Labor Party, have been embroiled in charges of anti-Semitism which they have conveniently brushed aside claiming they are only anti-Israel or anti-Zionist. This is the new fig leaf behind which anti-Semitism is currently ensconced. It is the fig leaf which Jeremy Corbyn uses to attempt and play off his honestly overt anti-Semitism. That brings up a question of how does one separate honest criticism of Israel from criticism which crosses into anti-Semitism? One of the most accepted tests is called the “3D test of anti-Semitism.” These three D’s are delegitimization of Israel, demonization of Israel, and subjecting Israel to double standards. We would like to point out that the easiest one to detect is the last, the double standard. When the BDS Movement refuses to boycott other nations which have a worse human rights record or also are occupying disputed lands, or are committing specious activities considered worse or are far more oppressive than Israel, then they are using a double standard when judging Israel. 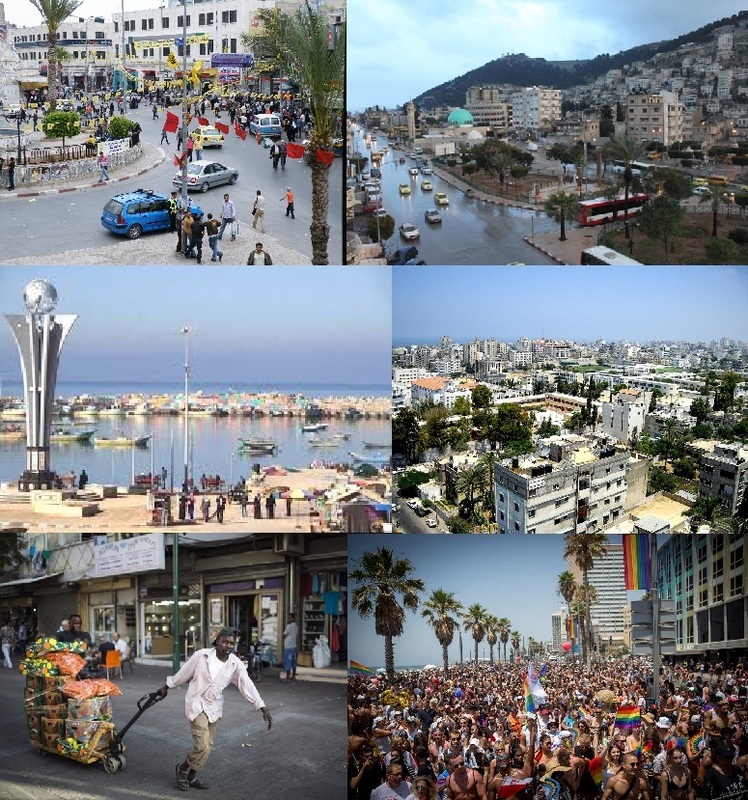 When they call for Israel to be destroyed through accepting many millions of refugees from the Arab world or making one super state out of the Palestinian Authority regions, Hamas’s Gaza, the aforementioned refugees and Jordan, these are forms of delegitimization as it transforms Israel from the homeland of the Jewish People into another Arab majority state with the Jews a likely persecuted minority. The final one is easily explained as when one refers to Israel as Nazi or the IDF of using Nazi tactics of genocide, then you have demonization. These are outright obvious examples and there are numerous far more nuanced means of still failing the Three D’s test. This test has been approved and adopted by the United States State Department in 2010 and remained in use until in 2017 when they adopted the Working Definition of Anti-Semitism authored by the International Holocaust Remembrance Alliance. The Working Definition of Anti-Semitism has become the virtually universal accepted definition adopted by numerous governments, the European Union, the United Nations Security Council and numerous NGO’s. It has also been rejected as being a Jewish induced plot to absolve Israel of her crimes against the Arab Palestinians, which is a form of anti-Semitism in and of itself. When one refuses to accept the otherwise accepted definition of actions of which they are guilty in order to claim that their actions are not anti-Semitism, they probably are strongly anti-Semitic. Further proof is readily found simply by reading almost any major newspaper, even the NYT, and within a week or so, there you will find articles reporting of Jews being attacked; Jewish cemeteries being desecrated; Synagogues being firebombed, desecrated, windows shot out, swastikas and anti-Semitic slurs painted on them or Jewish shops such as bakeries and kosher markets vandalized. These reports are currently more prevalent in Europe, but the United States is doing what she can to catch up. I remember when if you claimed that anti-Semitism was coming to the United States and growing there, you were basically laughed out of the conversation and people treated you like you were a nut case. There probably are places where such is still the case, but these are becoming rare as even the most news averse person will have at least overheard at least one conversation about the new and fresh anti-Semitism elected to the United States Congress or the near certainty that Jeremy Corbyn will become the next Prime Minister in Britain, depending on your circle of friends and coworkers and location. My advantage in reading the tea leaves about the growing anti-Semitism came by way of observation and experience which initially encouraged me to run faster than everyone else and later to be glad of my size as that prevented my need for speed which with age decreased greatly. Moving often for a decade also led to sampling most of the United States simply as my work had me living in a new Motel 6 every month to month and a half. The experiences and ability to see reality is greatly enhanced under such conditions though it can be a difficult life. The entire world has not gone around the bend; it just appears that way. 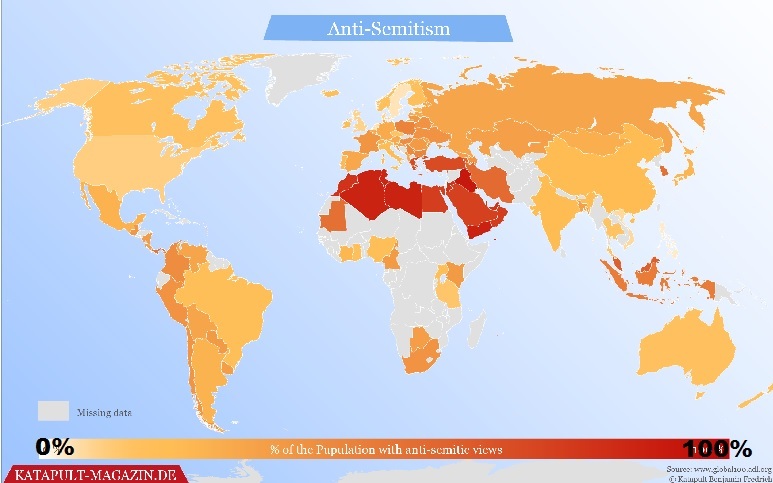 Below, we have included a map which depicts percentage of people with anti-Semitic views, often a fairly accurate indicator of anti-Semitism. There are numerous forms of anti-Semitism. There are those who simply hate Jews, period. This is what is found throughout much of the Middle East and North Africa (the Arab Muslim world), in groups such as the neo-Nazis (todays Nazis), the KKK and new on the list is Black Lives Matter. There are those who claim that the Jews are the reason they failed because the Jews controlled their company, the media, the banks, or have too much influence in the government or any number of the tropes Jews have heard for centuries. The newer version is that the Zionists or Israelis controlled their company, the media, the banks, or have too much influence in the government. You probably noted a similarity between the two lists, that is because they are the same excuses and stories which simply get recycled. The story that the Jews bake their Matzah using the blood of non-Jewish victims who they kidnap choosing some hapless soul and place them in a machine which has sharp points on the inside and tumbles bleeding out the person has been used by the Christian world and the Muslim world and has recently begun to be used by NGO’s and will likely spread once more. Another version of this blood-libel which is also in use is that the IDF steals body parts, eyes, kidneys, and other organs etc. for use in the Israeli hospitals, as they need these for Jewish patients. Anybody with even a cursory knowledge of medicine would immediately note that this would never work as transplants require genetic matching to have any possibility of being successful, thus it would be insane to go about such in this manner. The body parts falsehood is simply a modernized version of the Matzoh libel. Then there is the Czarist anti-Semitic invention “The Protocols of the Elders of Zion” (Russian: Протоколы сионских мудрецов) or “The Protocols of the Meetings of the Learned Elders of Zion” which weave a tale describing how the Jews are planning to take over the world, all 0.02% of the world population, the Jews, are going to take over the world. What was astonishing is that this was believed by the Russian people as they assisted in the pogroms and often with mass slaughtering of Russian Jews. This fiction is still being printed and distributed and has regained popularity in some places around the world. The only fortunate side to this is that it is most appreciated in areas where the Jews are already quite disliked, one could say hated. Mein Kampf has returned to print and supposedly is selling well despite a disclaimer that much of what is enclosed as being untrue, plus it can be found and read in its entirety on the Internet. You really can find just about everything on the Internet. All these things are going to do is add fuel to a fire which will soon be burning completely out of control across far too many swaths of land and groups of nations and people, more fuel is the one thing which is not needed. Then there are the defenses given by people which in and of themselves are simply a way of excusing their hatred and actions, sometimes explaining such to themselves so they will be able to dismiss their guilt and feel perfectly fine with their hatreds. Our favorite excuse is simply ridiculous and it goes, “Some of my best friends are Jews.” Then there is the excuse that, “Well, there are Jews who also claim that Israel is a horrible and racist place.” That or other claims against Israel, as that appears to be the main place this excuse is used and the people using it honestly believe that it holds some or complete validity. Here’s a small inside look into the Jews, some of the world haters of Jews have been Jews. Our favorite Jewish Jew hater is George Soros. He has claimed he cannot be anti-Semitic because he is Jewish and has many Jewish friends and a good number of his Jewish friends agree with him. We have to credit him with using the most number of refutable reasons which are refuted as they simply prove nothing. The Jews have been on both sides of virtually every issue since Moses and the twelve spies. Simple historic proof comes from two of the greatest murderers of Jews, Hitler and Stalin. Hitler claimed the Jews were all Communists and thus a threat to the Nazi state while simultaneously, Stalin claimed the Jews were national socialist supporters and enemies of the Soviet Union. There is a small validity to that as Jews supported the Communists and the National Socialists when their parties first rose to power and well before it became evident that the Jews were going to be used as the scapegoat by both the Nazis and the Soviets. Jews in the Muslim World, especially the Arab parts were also murdered in pogroms, rioting and other violence including in the Holy Land where the British often stood by and watched these riots until the Arabs came too close to the British before they would fire a single warning shot in the air bringing the violence to an end. 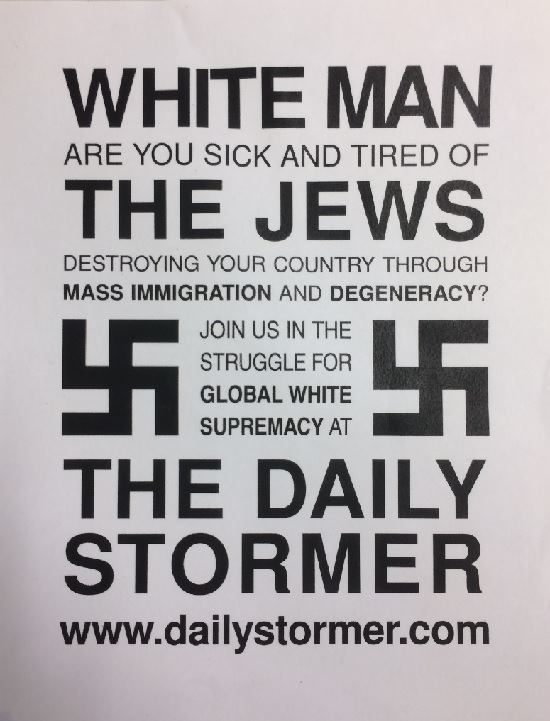 Some anti-Semites are so sure that their hatred is founded will actually state, “Well, you know, that is how those people are.” This is an unfortunate truth about all too many people, that they are so assured in their misbeliefs actually believing their excuses will indemnify them against being called a racist, an anti-Semite, an Islamophobe or whatever hatred in which they are steeped. Hatred is one of those unexplainable truths which exists and will remain prevalent in so many different forms all of which have one thing in common, they are self-enforcing through the circular logic which is used in powering their vile, loathing hostilities. Racial, religious, nationalist and other bigotries will likely never disappear until the coming of the Messiah, in the meantime, all we can do is to uncover and reveal these despicable acts for what they are, unfounded hate. 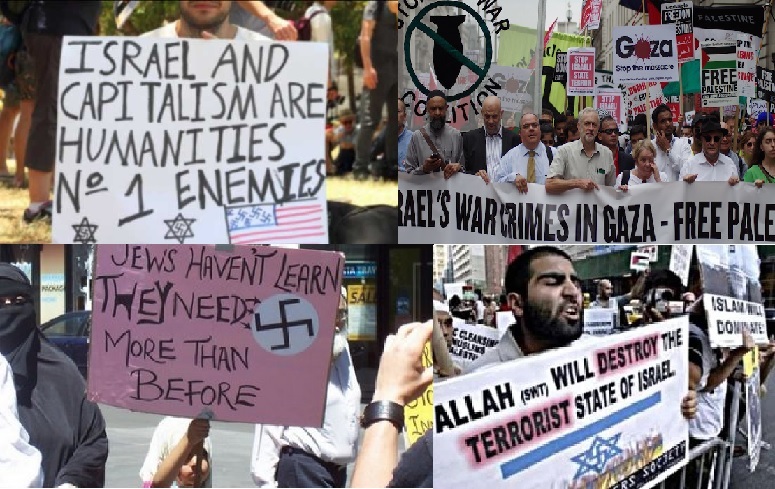 Anti-Semitism is just one of the oldest of these hatreds which has morphed into the forms of anti-Israel and anti-Zionist maligning defamation where many of the old stereotypical tropes have simply been made into nationalistic based falsehoods being presented as truth. Many of these are so easily taken apart as to be ridiculous, but people insist that they know the real secret which the rest of humanity is simply too blind to see. You cannot argue with such people as their minds are already set and nothing will sway them or force them to reconsider their beliefs. Even if you are able to silence them temporarily, they will simply walk away convinced, in the case of anti-Semitism, anti-Israelism or anti-Zionism, that you have been co-opted and turned by the Jew influence and that you are the one who needs to reconsider your lack of enmity towards the Jews, Jewish state or Jewish love of Israel. Senator Elizabeth Warren continued on her assumed guaranteed path to the Presidency following the lead of Representative Ilhan Omar choosing to denounce Israel above, beyond and before any other nation in her claim to the higher ground. Also, Senator Amy Klobuchar slammed Israel as she too seeks to lead the Democrats in their bid to regain the White House. Ms. Klobuchar took the lesser of the roads to perdition by simply slamming Israel for the deal between the Jewish Home and Otzma Yehudit referring to it merely as extremist and racist. Ms. Warren went a bit further stating, “First embracing right-wing extremism. Now manipulating a free press, accepting bribes, and trading government favors.” She then charged, accusing Netanyahu of delivering a “cut to the heart of a functioning democracy.” What is it with these Democrats and their campaigns for the Presidency, is Israel the sole country which has possible problems which in this case could be politically driven as the investigations have dragged on for over four years and suddenly, right after elections were called, then came charges timed to do the most damage to the ruling Likud Party and to Netanyahu himself. But, apparently, Israel with a sufficiently free press, despite claims to the contrary, came out and brought these charges into the open thanks to the “compromised” free press, as Ms. Warren claimed, and everything is being conducted in the open and will proceed through a presumption of innocence until proven guilty, except in the media and the campaigns apparently in both Israel and the United States. We find it fascinating that the first nation to be taken to task for its corrupted media and presumed compromised leader was Israel. Even before attacks on President Donald Trump, both Elizabeth Warren and Amy Klobuchar, not to bother mentioning Bernie Sanders who is always ready with an attack on Israel, and numerous others in the Democrat Party, would put Israel at the head of their campaigns as the nation the United States needs to hold to a strict standard and may desire to distance themselves from due to its weak respect for freedom of the press, racist politics, and compromised leadership whose moral compass may be skewed. Let us consider what other nations might have made the list for such problems ahead of Israel which these Democrats might have chosen for their example. First coming to mind would be the obvious choice of North Korea, a nation where the leader and those he favors live well and the common person all but starves; a nation with no regard for human life and absolutely no media outside of what the government prints and no elections not to mention that anyone daring to charge their “Dear Leader” with crimes would be executed the next day at sunrise. Then there is Venezuela which pretty much mirrors North Korea but the problem with both of these is it would place them in a position allied with President Trump. They could easily have chosen Russia and President Putin which would have had the added bonus of allowing them to bring up the Mueller investigation and the Russian collusion charges, but they went with Israel. They might have gone slightly northeast of Israel and gone with Bashir al-Assad who is gassing and bombing his own country and its people back to the Stone Age just so he can remain ruling whatever remains in the end, but they chose Israel to condemn. Then they could have accused Saudi Arabia who is suspected of having murdered and then dismembered a person who had made accusations of the Royal Family after luring him to their embassy in Turkey, but they claim that Israel suppresses opposition. We could continue adding Iraq, Iran, China or any of the other one-hundred-forty six nations out of one-hundred and eighty ranked which were determined to be more corrupt than is Israel, but Israel lead their list and we are willing to bet that Trump’s America would not be far behind on their lists. Perhaps next they would like to complain that there are Israelis who are less than overwhelmingly happy as Israel ranks merely as the eleventh happiest nations, but then they would have to accept that the United States came in at number eighteen, a full seven slots behind Israel. We could continue and point out that Israel ranks at the top for political rights, individual rights, freedom of the press and well in virtually every category in the freedom ratings. The main complaint, just in case the Democrats running for the White House would like a pointer as to what might be a valid claim, Israelis are required to carry identification and to show their identification before boarding trains or entering many buildings including retail malls. 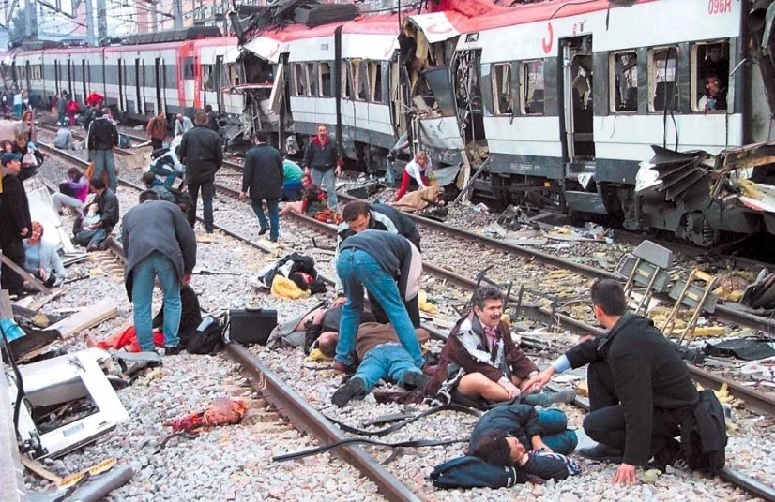 Well, we wonder why this might be, could it be to reduce the chance of terrorists gaining access to places where they could inflict the worst carnage as was the case when terrorists attacked trains near Madrid in 2004 resulting in almost two-hundred deaths and over two-thousand injured. As far as life in Israel is concerned, we have elections which suffer from the fact that we have a parliamentary system even more convoluted than others, we have more parties than flavors of ice cream (an exaggeration), we have to watch what we say about our little isolated place like heaven as people will believe any accusation or shortcoming, the media is just as strange as in the United States but there are some very decent smaller publications and even free newspapers, we are one of the few nations who has a major newspaper kept alive because of its foreign sales for the online version (Israel’s version of the NYT), freedom of speech, freedom to protest which is vigorously and enthusiastically used, equality of all varieties and about the only nation in the Middle East where gays are not persecuted and have full right of expressing their proclivities, complete religious freedom (the Baha’I have one of their two main centers in Israel with the other in India) and women are fully free and equal in every part of Israeli life. We have our problems like any other nation. We have checkpoints in order to protect the innocent from terrorism, a larger concern than in the United States but still manageable. There are beautiful beaches along the Mediterranean and skiing on Mount Hermon. Israel produces some of the world’s finest wines and has a broad selection of wines across a wide price range. Truth be told, until you have spent a couple of months, well, at least six weeks, in Israel, you really will not know Israel. Sure people come on a tour and see historic locations tailored to what the desired image the providers intend. That is one thing Israel is not short of, historic places, many of which date back more than three-thousand years. Just south of our location and visible from the train tracks or the main highway are the remains of a Roman aqueduct which probably does not make any tour guides itinerary. They just sit there looking, well, very Roman. Those who wish to show the mistreatment of Palestinians, there are four or five Potemkin villages set up for display in the West Bank, but they will avoid Nablus or any of the main cities as people driving Mercedes and Audis is bad for the poor and beaten down image they wish to sell. That is also the problem with trying to judge Israel from news reports; you will simply get the view intended and nothing even close to the reality. Even favorable coverage does not do Israel justice. We have everything from small mom and pop stores to department stores as well as what we call shuks and Americans would call farmer’s markets. Jerusalem has areas which probably have not changed since before Alexander the Great came rolling through here on his way to conquer Egypt, for him Israel wasn’t so much conquered as ignored but still subjugated and far more trouble than it was worth except as needed to reach Egypt, the real prize in those days. 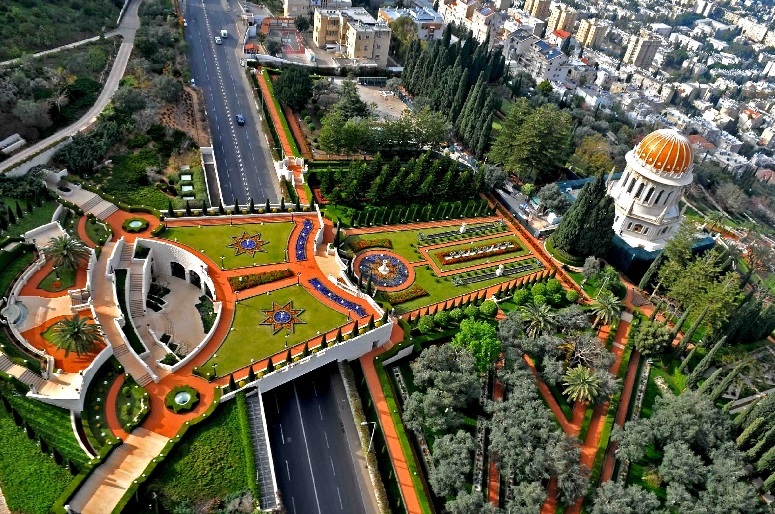 Then Jerusalem has malls just every major city in the Western World, a modern light rail system and an electric train which will eventually make the trip from Tel Aviv to Jerusalem with a stop at Ben Gurion International Airport in well under an hour. Healthcare in Israel is a comfortable balance between government guaranteed coverage and available options at relatively modest prices as there is competition between the different providers. We also have some of the finest hospitals in the world. When you get treated in Israel, you are not guaranteed Jewish doctors as we have a fair percentage of the physicians that are Arab Israelis as well as other places of origin or ethnic background. 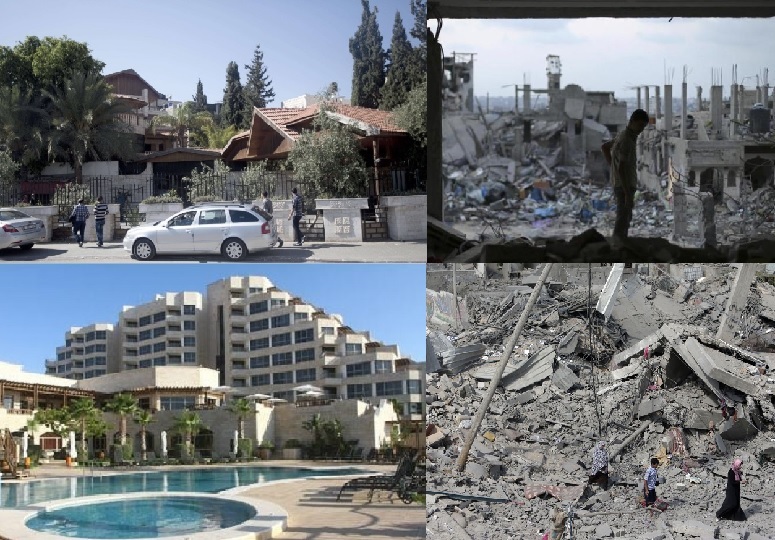 For fun, the pictures below are of Gaza, Nablus and Tel Aviv, two of each, so before looking at the caption, that would be cheating, try and decide which ones are which. Now that we have completed pointing out that Israel, while not perfect, is not exactly the nation one should start with when complaining about crooked politics, corruption, a compromised and slanted media or any other attacks one would wish to level outside of we have a very high percentage of Jews compared to other nations, which may be part of the reason we are placed so high on so many politicians’ target lists, shall we get back to the latest fascination of the Democrat Party, using Israel as their punching bag. There have been the accusations that Israel has been shooting innocent and peaceful Gazan protesters completely ignoring the obvious terrorism launched by these protesters which have included shooting at IDF positions, launching incendiary kites and balloons setting numerous serious fires, launching colorful balloons with cute toys attached loaded with explosive and set to detonate when squeezed or picked up, attempts to breach the border fence and an ecological attack caused by the burning of tens of thousands of tires to produce a smokescreen from which to hide their attacks. Then there are the accusations that Israel has not permitted the Palestinian Arabs to vote in elections. This is a trick question as the implication is that Israel does not permit them to vote in Israeli elections while the truth is that they have not been permitted elections by their own leadership. Hamas appoints who leads in Gaza as it is a terrorist dictatorship and Mahmoud Abbas continues to cancel elections within the Palestinian Authority as he knows he would lose his comfortable position. As far as their not being permitted to vote in Israeli elections, they are not Israeli citizens, they have their own governing bodies and territories which are independent of Israel. Gaza is completely independent of Israel and has been since September of 2005 after Israel pulled all her citizens and IDF forces from Gaza in the George W. Bush idea for showing how the Arab Palestinians could have a normal society given the chance so Israel gave them the opportunity with the Gaza Disengagement. The Palestinian Authority has had semiautonomous rule in northern Samaria in Area A and Area B while Israel retained complete rule in Area C as per the Oslo Accords of 1993. The reality is that Israel has not had direct rule over the Arab Palestinians since September of 1993 and Israel completely surrendered the Gaza Strip in September of 2005 with Hamas taking over in a coup in 2007 resulting in the blockade of Gaza after the Hamas takeover. Truth is the Gaza blockade was not put in place when the Arabs took control of Gaza but only after Hamas took control. Hamas is a terrorist organization which is sworn to destroy Israel and had, in their original charter, the Quranic verses calling for the killing of all Jews. The Gaza blockade also does not prevent aid from reaching Gaza; it only requires that Israel be permitted to check aid to make sure it does not contain weaponry or military grade equipment. Israel provides the aid through the Kerem Crossing with often caravans of semis going in to Gaza where the trailers are turned over to Hamas. Hamas has left aid undistributed preventing it from reaching their people so as to sell it on the black market or simply allow it to be wasted so as to continue the poverty amongst their people for use by media reporters who they provide minders to showcase what they wish the world to know. Below we included a comparison of the two Gazas, the one where the Hamas leaders and their benefactors and the other those who Hamas cares little for one way or the other. These are facts that Ms. Warren and Ms. Klobuchar along with the rest of the Democrats catering to the far left of the party will never admit exist. To them Israel is to be cast as pure evil and the worst humanity has to offer. They are targeting the anti-Semitic wing of their party and those who have drank the BDS propaganda, and also those who work to produce the BDS styled propaganda. The Democrat Party is not the same party which existed thirty years ago and that is likely only going to become more evident as time passes. But, you say, are not most Jews Democrat voters? Yes, but you are making an oft made error by equating Jews with Israel. There has been a drift away from Israel amongst Jews as they also have drifted away from traditional Judaism, stopped going to daily services with many not going to services with possible exception of the High Holidays, if then. The Reform Jews, those whose parents were Reform Jews, have intermarried at an alarming rate of over fifty percent and all but completely left the religion and have virtually no compassion one way or the other, or are as rabidly anti-Israel as the Democrat candidates are proving to be, when it comes to Israel. You are likely to find numerous Jews who because they wish to be included in the leftist protest movement will join the BDS or simply reject supporting Israel as due to intersectionality, supporters of Israel are banned from joining in most progressive protests and are excluded from all women’s march and affiliated events. This is part of the reason why we will see ever more left wing politicians and organization turning against Israel. This is a well orchestrated and financed, as explained in the above link, operation which targets only Israel while turning group after group against Israel by threatening to marginalize their cause and prevent people from supporting their protests. 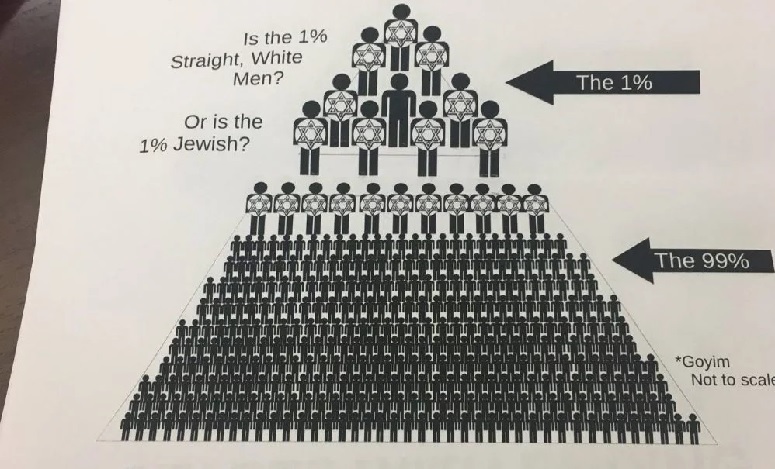 Either you can support Israel or you can pass the intersectionality test, but you cannot do both. There was a turning point in the Civil Rights movement after Martin Luther King was assassinated where the Jews went from being strong supporters of the movement, most still support equal rights completely, to the Black Lives Matter turn against Israel and their joining with such as the Occupy Movement and the BDS movement in targeting Israel and the Jews. Anti-Semitism is growing on campuses across America and many professors now teach in their humanities classes that Israel is evil and some go as far to state that Israel is evil because Jews are evil. With such in the society and growing, it will become natural for political candidates to cater to the anti-Israel position, especially as it will not necessarily hurt them with the Jewish vote. Additionally, the Jews are a small percentage and Arab oil monies are being funneled into leftist campaigns replacing the one influence which had been considered the Jewish weapon. Additionally, the majority of pro-Israel Jews are living in Israel and even should they use their citizenship and absentee ballots, they came from such left wing bastions that their vote is irrelevant. Just as Jeremy Corbin has become the leader of British Labor and anti-Semitism will soon be rife in that party, the Democrat party is less than a decade behind them. Pro-Israeli positions are becoming a right wing and nationalist position and are being shunned if not abhorred by the leftist, internationalist agenda. Eventually, the internationalists will take control of the left wing political parties as they continue to drift leftward and the concurrent anti-Semitism, anti-Zionism and anti-Israelism will take the fore as these parties take over in Europe and possibly in the United States and Canada. Once this has taken hold, Israel will become the isolated nation the world will love to hate and even the Security Council will pass condemnations of Israel and may even once again declare Zionism equal to racism and eject Israel from the world body, which may be the nicest thing they could ever do. When the world turns to destroy Israel it will be a sad day and signal the death of Western culture as one cannot turn against those who laid the basis for the Judeo-Christian ethic and remain the beacon of the free world and even if you do not recognize it, lose it and you will no longer be free.